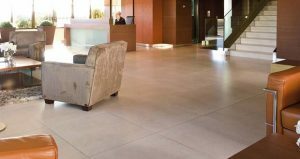 Fieldmans Access Floors are the sole UK suppliers of Porcelanosa Raised Access Floors. Flooring that combines the beauty and benefits of a traditional tiled surface, with the advantages of a raised access flooring system. Raised Access Flooring provides quick, flexible access to all cabling, wiring and piping, offering the aesthetic advantage of a cable-free uncluttered environment, together with the elegance and high quality design of Porcelanosa floor tiles. Porcelanosa have produced two systems of flooring tiles; the exterior and the interior. 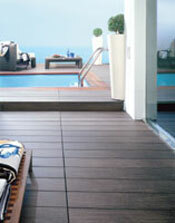 Porcelanosa professional have produced access flooring tiles suitable for external use, such as on roof terraces. Each of the components normally used for indoor use, such as the pedestals and beams, have been slightly modified so that they are suitable for outdoors. For example, the beam is adapted to allow natural joints to fall between the tiles, thus creating a small drain to allow rainwater to drain away into a drainage point. The Porcelanosa professional exterior access flooring tiles are finished with an anti-slip coating to ensure they are perfect for outdoor use. The interior access flooring system is comprised of three main parts; the pedestal, stinger and tile. The pedestal acts as the support foundation for the access flooring, and the stringers are internal beams that offer support. Porcelanosa provide the third component – the tile. Porcelanosa provide eight different groups of finishes; contemporary, marble, parquet, porcelain, wood effect, traditional, terracotta and stone. Within each of these groups are a variety of finishes, suitable for any environment – from traditional to modern. Elevated and solid flooring for modern offices and IT data centres. Modified components which are suited to outside weather conditions. Perfect for roof terraces and landscaped residential projects. Fieldmans Access Floors Ltd has been successfully installing raised access floors across London, all of the UK and abroad since 1993, quality and client satisfaction are always the highest priority . We are completely independent allowing us to use the product that is correct for our clients’ requirements. We directly employ our staff, negating the need for any reliance on subcontractors. Should you wish to contact Fieldmans Access Floors Ltd directly regarding Raised Access Flooring, for a no-obligation site survey or just some advice, please call on 020 8462 7100 or click the contact button.